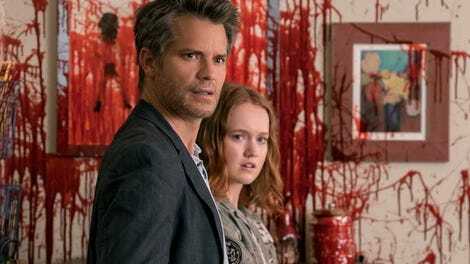 After the slam-bang season two premiere where the Santa Clarita Diet-ers had to solve some serious problems, it’s back to business as usual for the Hammonds. But a couple new wrinkles are teased that should provide plenty of wacky hijinks and fun storylines for the season. For Joel and Sheila, they have their eyes on a new housing development that would be a serious get for our resident real-a-tors (solidarity with Sheila, even if it’s incorrect). Their boss (the always-delightful Andy Richter) says that development is on hold since Gary’s disappearance, but if the Hammonds can land a fancy-pants listing for the firm, he’ll let them move forward with the development. The wealthy seller in question is ... well, it doesn’t really matter what her character name is because I shouted “Markie Post!” as soon as she came on screen and I shall continue to do so for the duration of this review. Big Night Court fan over here. Anyway, Markie Post! is one of those rich, kinda lonely people who is way too into her dog. Joel and Sheila are making inroads with her when who should arrive but their apparent real estate nemeses, Chris and Christa. 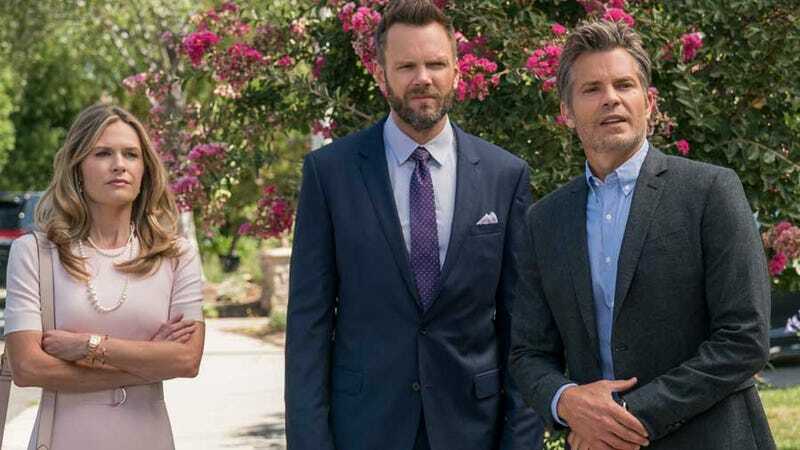 This is another terrific bit of casting because Joel McHale is highly skilled at playing a d-bag and Maggie Lawson is quite the Gal Friday for him, it turns out. I mostly know her from Psych and she was great on that. This is a bit of a departure from Jules, but Lawson can definitely handle the sugar-won’t-melt-in-my-mouth two-face that is Christa. Chris and Christa make their own play for Markie Post!, sucking up to her apparent love for Johnny Depp by getting her a visit to his latest movie set (I’ll get to that particular bit in a moment). But Joel knows the way to Markie Post!’s heart, so he lets her dog outside in order for Sheila to rescue it. You see, Sheila has a lot of pent-up zombie aggression, which she works out by chasing rabbits in the desert. So she’s more than ready to chase down Markie Post!’s little fuzz ball, which earns them the listing. It did seem a couple times there that instead of rescuing little Rachel, the poor pup was going to run into traffic and get smushed, so I’m glad the show didn’t go that way. I don’t mind the crazy gore when Sheila is eating people, but let’s not be smashing any puppies, OK? Everything’s coming up roses for the Hammonds work-wise, except—ruh roh. The development is where they buried Gary’s body, so they now have to dig him up to move his remains. But it turns out Gary isn’t totally dead! He’s completely dismembered, but his head is definitely an undead zombie. Nathan Fillion’s head in a jar, anyone? That would make a nice addition to the Hammond mantle. Meanwhile, Abby and Eric realize they have to get rid of the e-paper trail linking Goran’s email to their ad for bile, so they chisel his thumb out of ice at the storage unit, use it to unlock his computer and delete the emails. Um, why wouldn’t they just take his computer when they got there and realized they needed a fingerprint to unlock it? Because then it looks like he was robbed and that helps explain his disappearance. I expect a little better from Abby and Eric, honestly, so that was a little sloppy on the writers’ part. Anyway, as our teen criminals are leaving after having successfully covered their tracks, they encounter two strangers coming into Goran’s apartment who are also wearing blue rubber gloves. Everyone lies to each other, but after Abby and Eric leave, the two newbies talk about “the bile.” So, are other people advertising for bile in order to concoct the zombie serum? Do these guys have anything to do with Ramona? Guess we’ll see. ... who are you guys? It’s not the most exciting episode of the show, though it certainly had plenty of funny moments. It’s nice to see the Hammonds remember they have jobs and do things that are more mundane since at its heart this show is a family comedy. Not that the Hammonds haven’t had a ton of things to do lately, but it can’t all be zombie paramours (Loki) and threatening neighbors (Dan) 24/7. Speaking of neighbors, Lisa and Anne are still going strong in the wake of Dan’s disappearance, which is a lot of fun. Sheila wants to be friends with them, though Joel is quite nervous about opening that particular can of worms—and I’m with Joel. Lisa may be an unobservant ditz, but Anne most definitely is not. Gotta get me a hammerknife. That seems like quite the multi-functional tool. The way Joel snickered when Richter said Gary could “sell farts to an *sshole” was great. It almost felt like it was Olyphant laughing. Same goes for Barrymore’s delivery on the “whoa” in response to Lawson’s threat. I’m not sure how I feel about the way the show is handling the Abby-Eric-Ramona thing. Abby seems supportive and it would be nice if that were genuine and not her doing the thing where she’s jealous, so to compensate she acts supportive and pushes Eric toward Ramona. That’s such a trope and I like it when a show surprises me, so I hope that isn’t the way they’re going here. I’ll give the Santa Clarita Diet writers the benefit of the doubt that they’re going somewhere more interesting with this. I’m also going to choose to believe the show’s writers picked Johnny Depp for the Markie Post! gag because they’re making a commentary about the kind of people who are still super into Depp and not that they’re just that tone-deaf to the current media landscape.